The Samoan Islands were first settled some 3,500 years ago as part of the Austronesian expansion. Samoa's early and more current history is strongly connected with the histories of Tonga and Fiji, which are in the same region, and with whom it shares historical, genealogical, and cultural traditions. After World War I, German Samoa became a Trust Territory and eventually became independent as Samoa in 1962. American Samoa remains an unincorporated territory of the United States. Archeologists place the earliest human settlement of the Samoan archipelago at around 2850 years before present. This date is based upon the ancient lapita pottery shards found throughout the islands; The oldest evidence being in Mulifanua. This area of Polynesia, Samoa and Tonga, contains evidence from dates of similar times, suggesting the area was settled during the same period. Samoan oral history, however, extends only as far back as AD 1000 Whatever occurred between 750 BC and AD 1000 remains a mystery, though this may have been the period of great migrations that led to the settlement of present-day Polynesia. Another mystery is that the making of pottery suddenly stopped; there is no oral tradition among the people of Samoa that explains this but some theories suggest the lack of available pottery-making materials in Polynesia meant the majority of pottery was imported during migration and not locally sourced or made. Tagaloa was a Dynasty that ruled a Pacific Empire around Fiji Tonga Samoa, before the emergence of the Tui Manu'a. Ancient Samoan oral traditions known only by direct descendants ( and hidden for thousands of years) speak of Lumatagi, 'Lu of the winds' who discovered New Zealand, and saw icebergs in the south. He named New Zealand Savai'i laulau. Stretched out Savai'i as they often named volcanic islands after Savai'i. He had a gigantic canoe called 'blink of an eye' because it was so fast. He was also Lufasiaitu, 'Lu the ghost slayer', who defeated Tagaloa and finally ended his power. His grandfather had discovered Hawai'i. 1934 Sketch map showing the central position of the Samoa Islands in the Pacific. Linguistically, the Samoan language belongs to the Polynesian sub-branch of the Austronesian language family, whose origin is thought to be in Taiwan. According to oral tradition, Samoa shares the common Polynesian ancestor of Tagaloa. The very earliest history of Samoa concerns a political center in the easternmost Samoan islands of Manu'a, under the rule of the Tui Manu'a. In the Cook Islands to the east, the tradition is that Karika, or Tui Manu'a 'Ali'a, came to the Cook Islands from Manu'a; suggesting that it was from Manu'a and Samoa that the rest of Polynesia developed. The Tui Manu'a gained his name when he first defeated Tagaloa in a battle over the Faleula , and in doing so was injured gaining the name Tui Manu'a approximately 2,000 years ago. Also there are oral traditions that the name of Samoa based upon Sa Moa 'sacred hen', where Lu ( Lufasiaitu) finally defeated Tagaloa and took all his power and married his daughter. The TuiAtua was one of Tagaloa's titles. Moa was also the family name of the Tui Manu'a so another interpretation is that SaMoa is the family of Moa, the Tui Manu'a. Tui Manu'a and Leifi TuiAtua Faanonofo (son of Lu) ruled Samoa. Tui Manu'a was the elder brother and there are still 2 posts in the meeting house of the Tui Manu'a where only two kings are allowed to sit. The Tui Manu'a and Leifi. The Tui Manu'a controlled a pacific empire, extending over Tonga Fiji, cook islands etc, and Leifi was his war leader. He also fought internal wars. The Red fish of Manu'a went to war and destroyed the Shark of Savai'i. Leifi also would bestow another TuiAtua title. The TuiAtiua title has always been bestowed by Leifi, mostly in the last 1,000 years at his malae of Kings at Lufilufi. Various families and people would competeeg sons of the TuiManu'a and Leifi would decide who he would give it to. In more modern times, it was mainly the Tama Aiga that Leifi/Fuataga would bestow the TuiAtua on, eg Salamasina. The Papa or 4 titles were all originally created by Leifi, but were later brought together by the Tama Aiga as an important collection of titles. Leifi bestowed the Tui Atua and created the Tui A'ana. He had originally made the Vaetamasoalii and the Ngailetoatele which the people of A'ana and Tuamasaga had asked for, as he would not give them a Tui title. However he had destroyed these lesser titles when he created the TuiA'ana title at his malae, at the last Tofiga of Kings with the Tui Manu'a present. This was the last Samoan Tui created. This was for services rendered to him by the people of A'aana in a war against Tu'amasaga. This was over the theft of the Pu'a tree (originally Leifi had brought it to Samoa) and the people of A'ana had located it with the Tuamasaga, and killed many to return it. They had piled the bodies of the Tuamasaga warriors as high as a tree, so the saying goes, piled as high as a tree. Then they returned it to Foga'a. Thereby the saying , take all good things to FGoga'a. Later the 2 lesser titls were used as womens names and these similar ones were passed off as the ancient original ones. These are the Natoitele, and Tamasoali'i. The Tui Manu'a was ended by the US govt. The bestowed TuiAtua ruled Samoa, but part of Samoa was taken over during the Tongan invasion. Originally Samoans and Tongans were one people, but as numbers increased, Fiji and Tonga became separate and then made their own Tui titles, Tuifiti and TuiTonga. One of Leifi's titles was Defender of Manu'a, and his island was Tutuila. Leifi fought off many waves of invasion from Fiji and Tonga. Leifi became Fuataga ( now about 76 generations of title holders), TuiAtua Faanofonofo ( The TuiAtua that remains), the Matua, (the Father). Leifi also created and bestowed the Tui A'ana title and gave the people of A'ana control and right to bestow it. There is an ancient saying " All honours of Samoa come from Leifi". However in modern historic times, the Govt and the Tama Aiga ( children of the family) now control Samoa. Samoa's history early was interwoven with that of certain chiefdoms of Fiji as well as the history of the kingdom of Tonga. The oral history of Samoa preserves the memories of many battles fought between Samoa and neighboring islands. Too, intermarriage of Tongan and Fijian royalty to Samoan nobility has helped build close relationships between these island nations that exist to the present; these royal blood ties are acknowledged at special events and cultural gatherings. Other Samoan folklore tells of the arrival of two maidens from Fiji who brought the tools necessary to create the art of tatau, or in English tattoo, whence came the traditional Samoan malofie (also known as pe'a for men and as malu for women). The foundation of the cultural tradition of Samoa, or the fa'asamoa came with the rise of the warrior queen Nafanua. Her rule instituted traditions of the fa'amatai or local family and village and regional chiefly systems, a decentralized system. Her niece Salamasina continued under this system and their time is considered a golden age of Samoan cultural traditions. Contact with Europeans began in the early 18th century but did not intensify until the arrival of the British missionaries. In 1722, Dutchman Jacob Roggeveen was the first European to see the islands. This visit was followed by the French explorer Louis-Antoine de Bougainville (1729–1811), the man who named them the Navigator Islands in 1768. In 1787 Jean-François de Galaup, comte de Lapérouse visited Samoa, where at Tutuila Island, in what is now American Samoa, there was a conflict leading to deaths on both sides, including the deaths of twelve Frenchmen. European and Tahitian and Cook Islander Missionaries and traders, led by John Williams (missionary) began arriving around 1830. Coming via Tahiti, they were known in Samoa as the Lotu Taiti. The Rev. John Williams was helped by the Ali'i Malietoa Vainu'upo to establish the Lotu Taiti, which became the Christian Congregational Church of Samoa. The United States Exploring Expedition (1838–42) under Charles Wilkes reached Samoa in 1839 and appointed an Englishman, John C. Williams, son of the missionary, as acting U.S. consul. However this appointment was never confirmed by the U.S. State Department; John C. Williams was merely recognized as "Commercial Agent of the United States". A British consul was already residing at Apia. In 1855 J.C. Godeffroy & Sohn expanded its trading business into the Samoan Islands, which were then known as the Navigator Islands. During the second half of the 19th century German influence in Samoa expanded with large plantation operations being introduced for coconut, cacao and hevea rubber cultivation, especially on the island of 'Upolu where German firms monopolized copra and cocoa bean processing. British business enterprises, harbour rights, and consulate office were the basis on which Britain had cause to intervene in Samoa. The United States began operations at the harbor of Pago Pago on Tutuila in 1877 and formed alliances with local native chieftains, most conspicuously on the islands of Tutuila and Manu'a (which were later formally annexed as American Samoa). The Second Samoan Civil War reached a head in 1898 when Germany, Great Britain and the United States disputed over who should control the Samoan Islands. The Samoa Tripartite Convention of 1899, a joint commission of three members composed of Bartlett Tripp for the United States, C. N. E. Eliot, C.B. for Great Britain, and Freiherr Speck von Sternburg for Germany, agreed to divide the islands. The Tripartite Convention gave control of the islands west of 171 degrees west longitude to Germany, (later known as Western Samoa), containing Upolu and Savaii (the current Samoa) and other adjoining islands. These islands became known as German Samoa. The United States was given control the eastern islands of Tutuila and Manu'a, (present-day American Samoa). In exchange for Britain ceding claims in Samoa, Germany transferred their protectorates in the North Solomon Islands and other territories in West Africa. It does not appear that any Samoans were consulted about the partition and the monarchy was also abolished. Exiled group aboard German warship taking them to Saipan. Standing 3rd from the left is Lauaki Namulauulu Mamoe, 1909. World War I broke out in August 1914, and soon after, New Zealand sent an expeditionary force to seize and occupy German Samoa. Although Germany refused to officially surrender the islands, no resistance was offered and the occupation took place without any fighting. New Zealand continued the occupation of Western Samoa throughout World War I. Under the Treaty of Versailles in 1919, Germany relinquished its claims to the islands. In November 1918, the Spanish flu strongly hit the territory. 90% of the 38,302 native inhabitants were infected and 20% died. The American Samoa population was largely spared this devastation, due to vigorous efforts of its Governor. This led to some Samoan citizens petitioning in January 1919 for transfer to U.S administration, or at least general British administration. The petition was recalled a few days later. The Mau movement gained momentum with Samoa's royal leaders becoming more visible in supporting the movement but opposing violence. On 28 December 1929 Tupua Tamasese was shot along with eleven others during an otherwise peaceful demonstration in Apia. Tupua Tamasese died the following day; his final words included a plea that no more blood be shed. New Zealand administered Western Samoa, or Samoa i Sisifo in the Samoan language, first as a League of Nations Mandate and then as a United Nations Trust Territory until the country received its independence on 1 January 1962 (from New Zealand) as Western Samoa. Samoa's first prime minister following independence was paramount chief Fiame Mata'afa Faumuina Mulinu'u II. Samoa i Sisifo was the first Polynesian people to be recognized as a sovereign nation in the 20th century. Samoa became one of the Member states of the Commonwealth of Nations on 28 August 1970. In 1977, Queen Elizabeth II visited Samoa during her tour of the Commonwealth. In 2002, New Zealand's prime minister Helen Clark formally apologized for two incidents during the period of New Zealand's administration: a failure in 1918 to quarantine the SS Talune, which carried the 'Spanish 'flu' to Samoa, leading to an epidemic which devastated the Samoan population, and the shooting of leaders of the non-violent Mau movement during a ceremonial procession in 1929. In 2007, Samoa's first head of state, His Highness Malietoa Tanumafili II, died at age 95. He held this title jointly with Tupua Tamasese Lealofi until the latter's death in 1963. Malietoa Tanumafili II was Samoa's Head of State for 45 years. He was the son of Malietoa Tanumafili I, who was the last Samoan king recognized by Europe and the Western World. Samoa's current head of state is His Highness Tui-Atua Tupua Tamasese Tupuola Efi, who was anointed the head of state title with the unanimous endorsement of Samoa's Parliament, a symbol of traditional Samoan protocol in alignment with Samoan decision-making stressing the importance of consensus in the 21st century. ^ Petchey, Fion J (2001). "RADIOCARBON DETERMINATIONS FROM THE MULIFANUA LAPITA SITE, UPOLU, WESTERN SAMOA". Radiocarbon. 43 (1): 63–68. ^ a b Tuvale, Te'o. "An account of Samoan history up to 1918: Chapters I-IV". Retrieved 19 September 2011. ^ a b c d Ryden, George Herbert. The Foreign Policy of the United States in Relation to Samoa. (Yale University Press, 1928), p. 574; the Tripartite Convention (United States, Germany, Great Britain) was signed at Washington on 2 December 1899 with ratifications exchanged on 16 February 1900. ^ Paul M. Kennedy, The Samoan Tangle: A Study in Anglo-German-American Relations 1878–1900 (University of Queensland Press, 2013). ^ a b Stevenson, Robert Louis. A Footnote to History: Eight Years of Trouble in Samoa. BiblioBazaar. ISBN 978-1-4264-0754-3. ^ a b Kohn, George C. (1986). Dictionary of wars, Third Edition. Facts on File Inc, factsonfile.com. pp. 479–480. ISBN 978-0-8160-6577-6. ^ New Zealand Ministry for Culture and Heritage (19 July 2010). "Towards independence - NZ in Samoa". nzhistory.net.nz. Retrieved 29 April 2011. Kennedy, Paul M. The Samoan Tangle: A Study in Anglo-German-American Relations 1878–1900 (University of Queensland Press, 2013). Ryden, George Herbert. 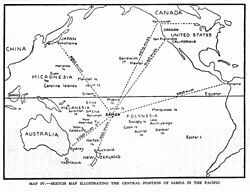 The Foreign Policy of the United States in Relation to Samoa (Yale University Press, 1928).